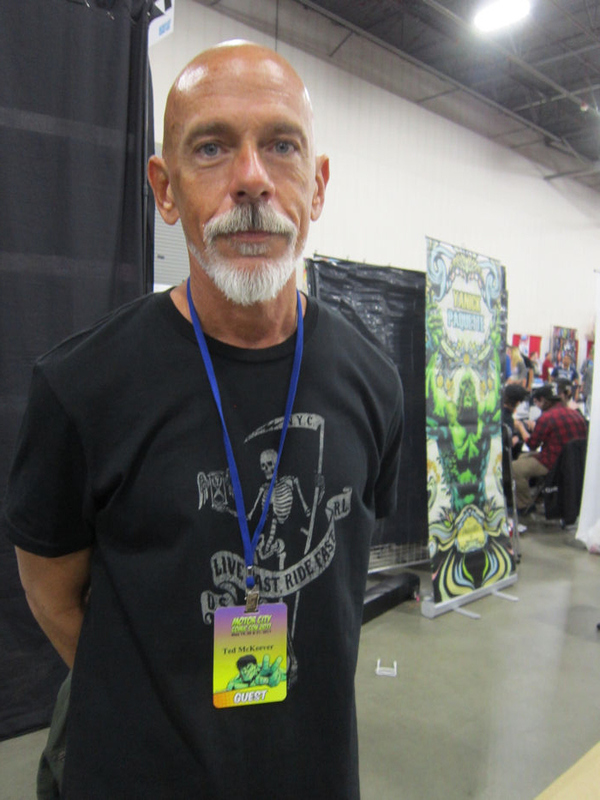 Motor City Comic Con 2017 Photos, Part 2 of 2: Who We Met and What We Did « Midlife Crisis Crossover! My wife with Barbara Eden, star of TV’s I Dream of Jeannie. This con was my birthday trip, but Anne was pretty elated with her end of the deal. 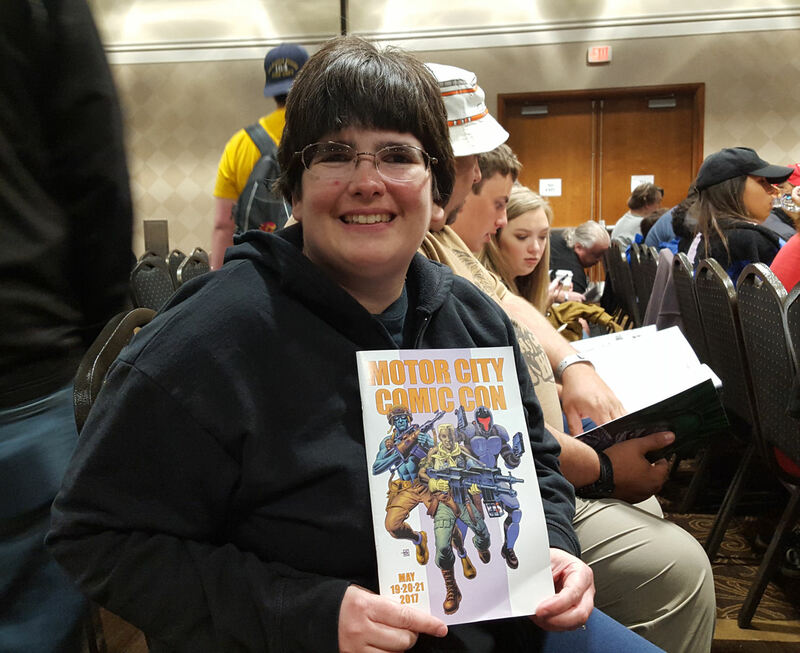 This weekend Anne and I had the pleasure of attending the 28th annual Motor City Comic Con in the city of Novi, a safe suburb northwest of Detroit, some 300 miles from home. Well established and catering to fans of comics and media guests alike, MCCC is a shade smaller than our two regular Chicago shows, but proved an excellent reason to return to Michigan for our first time in fifteen years. Whenever we attend a new con, the same set of fears nips at us every time. How crowded will it be? Do the showrunners know what they’re doing? Is the layout simple or complicated? Are their attendees nice people? Is the parking convenient and/or affordable? How horrible is the convention center food? We were relieved to confirm by the end of the day that MCCC by and large has nearly all its gears locked properly in place, and plans afoot to solve the one issue that complicated matters for a bit of the afternoon. Every show has its issues, but the best ones are already working on solutions before you can tell them about their problems. We planned the entire outing less than two weeks before it arrived, not enough notice to use vacation days for an expanded weekend. The best we could do was negotiate leaving work early Friday and spending the afternoon and early evening on the road. Thanks to atrocious construction gridlock on I-69 in Indiana, our four-hour drive stretched past the five-hour mark. We didn’t arrive at our Toledo hotel till after 8 p.m., leaving us no time to explore our surroundings. So that part’s boring, especially the long haul up US 24 from Fort Wayne to Toledo, one of the most featureless freeways I’ve ever driven. 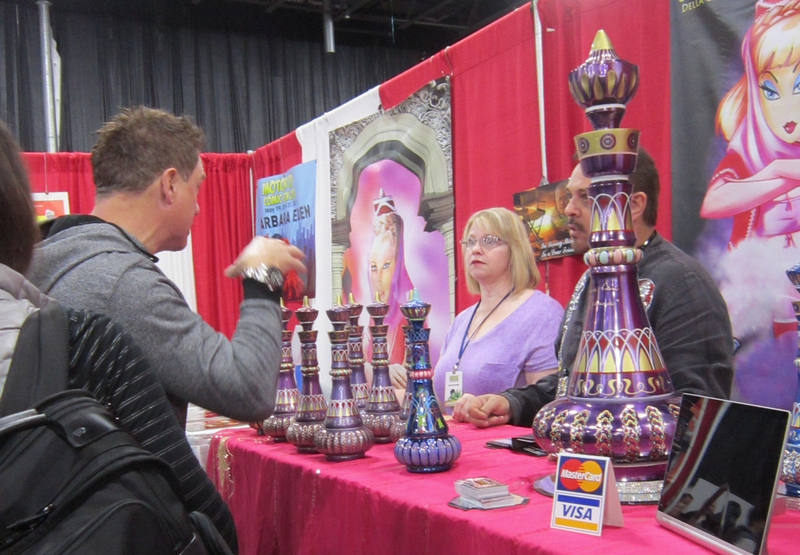 MCCC is held each year at Novi’s Suburban Collection Showplace, an hour north of our Toledo hotel. It’s smaller than our own Indiana Convention Center, with a single exhibit hall the size of our Halls F through K put together (what Indiana Comic Con and Indy Pop Con typically use), plus five speaker/panel/conference rooms and an attached Hyatt. Signs announced an expansion forthcoming on its west end circa spring 2018. Surrounding it on all sides are a few thousand parking spaces; the website provides added directions to grass lots across the street, a local high school offering more spaces, and other lots around town with shuttle service to and from the con. It’s technically part of the kingdom of Detroit, land of car lovers. If you brought a car, someone will take care of your parking needs. Saturday morning we arrived shortly after 8 a.m. to find several dozen fans in line ahead of us, already filing inside the doors. After picking up our wristbands we were treated to MCCC’s most magical touch. Many cons let early arrivals wait standing up in a long line or narrow crowd, sometimes outdoors regardless of temperature. Sometimes we’re ready for naptime by the time the exhibit hall opens. Not so with MCCC: once registered, everyone was directed to go have seats in the speaker rooms in order of arrival. Thus we waited in comfy chairs, not standing on cruel concrete, till the exhibit hall would open at 10:30. 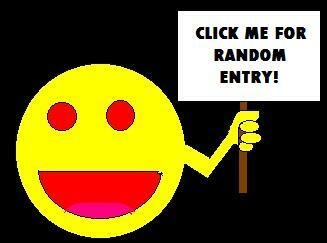 Why is this woman smiling? Because she’s sitting. Then we read the fine print in the program and realized anyone who ordered advance tickets online would be allowed to start conning at 10 sharp — no VIP badge required, just a reward for the faith you showed by putting up money up front. That included us, even though we cut the deadline a bit close. At 9:45 someone in charge said “What the heck” and began ushering us in even earlier. We refused to complain. We were off and running, heading toward the media guests’ autograph aisles to take care of what we assumed would be the most draining part of our day. 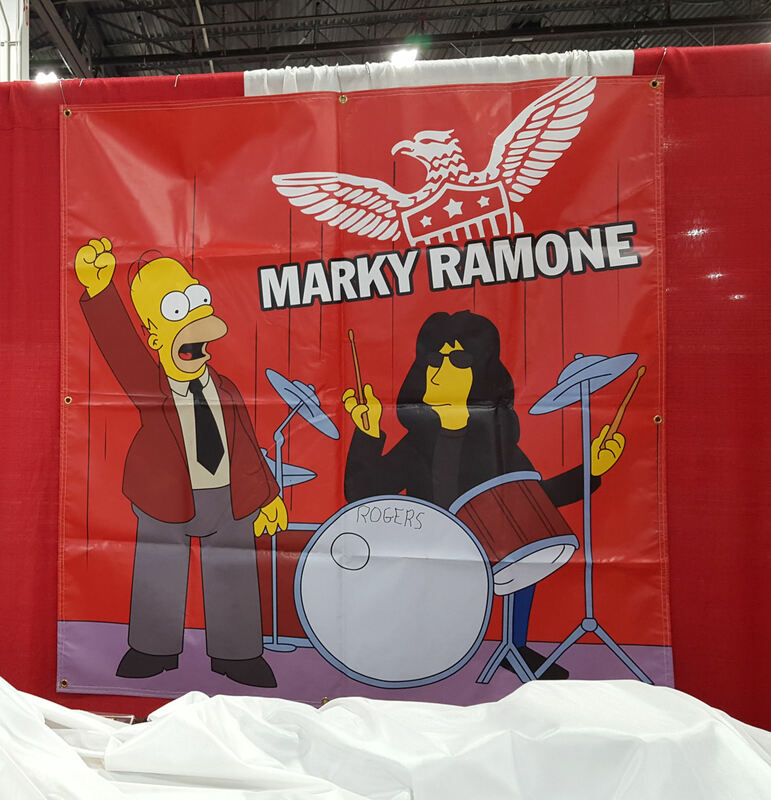 My first stop: the booth of Marky Ramone, drummer for the Ramones. That’s right: as seen on The Simpsons! Even if you know zilch about punk rock, you’ve probably seen an episode of theirs. I can count the number of accomplished musicians I’ve met on one hand, and very nearly never at a “comic con”. When I discovered at age 16 that there was more to music than what commercial radio is paid to share with the masses, the Ramones were among the first wave of bands to latch on to the part of my brain that craved something thoroughly different. The Ramones’ songs were ridiculously short, blunt, repetitive, deceptively simple, pure, undiluted, no-frills, breakneck-speed capital-R Rock with a solid backbone and an authenticity borne of their NYC upbringing that spoke to outcast li’l me hundreds of miles away in my lower-class neighborhood. No pageantry, no pretension, no trendy dance beats, no backup singers, no drumless acoustic ballads pandering for airplay — just simple chords, basic declarations, and fearless martial rhythms that were like my mental jet fuel. Of the seven men who ever recorded officially as a Ramone, Marky is among the last three still alive. Frankly, he’s the #1 reason we chose MCCC as my birthday outing. So yeah, you bet I was first in his autograph line. Meanwhile, Anne was first in line at the booth right next door. Its proprietor: Barbara Eden, iconic star of TV’s I Dream of Jeannie. 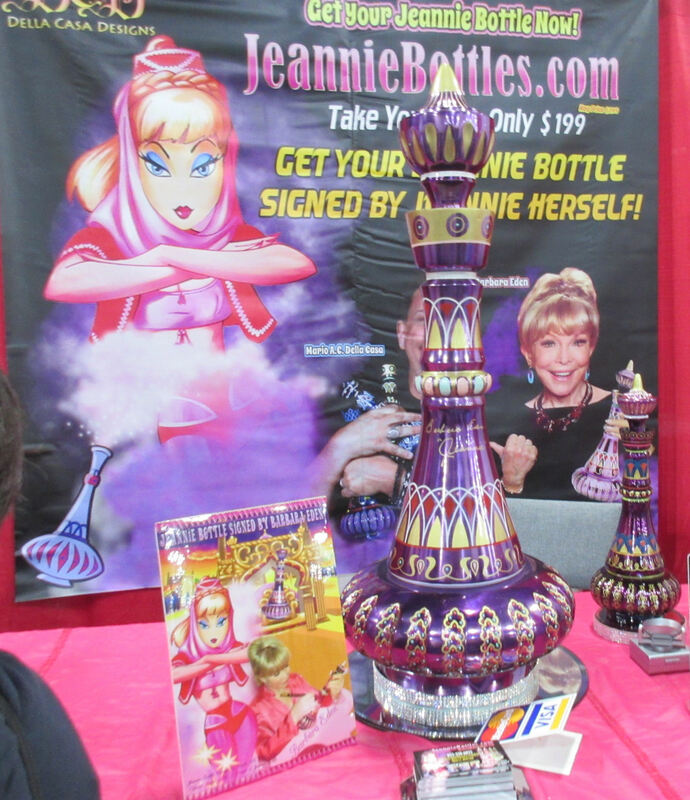 Hers was among the most lavishly decorated booths, covered in Official Jeannie Bottles she’d be happy to sign. Classic TV from the ’50s to the ’80s was the hardest drug Anne ever mainlined in her youth. Naturally I Dream of Jeannie was on her watchlist, bedazzling her with the silly special effects and witty repartee between costars Barbara Eden and Larry Hagman. So yeah, you can bet Anne was first in Eden’s line. Well, not counting the fans with VIP badges who would be allowed ahead of her. That’s part of the game, which we recognize and accept. But sometimes even VIP badgeholders have to step back when an actual VIP wants a place in line. Anne and several others got the most delightful surprise to find themselves joined by John Barrowman. You might remember him from such TV shows as Doctor Who, Torchwood, Arrow, and Legends of Tomorrow. He bought himself a bottle but departed for his own booth since she wasn’t there yet. Time flew while we waited for the stars to arrive around 11. On the other side of Ramone’s booth, Gotham costar Robin Lord Taylor arrived at 10:20 and slowly built up a line as passersby realized he was an early bird. Ramone arrived at 11:08 to Anne’s applause from the next booth over. He turned to her, smiled, and said, “Hey ho, let’s go!” She took this a a cue that meant something and applauded some more. I explained “Blitzkrieg Bop” to her later. Once he was settled in, I approached and prattled on while he signed my copy of his autobiography. I must’ve rambled more than I thought because not only did he sign it and add a message, he was also starting to draw stick figures in it till I shut up and made way for the next fans behind me. I was a little annoyed that his serpentine line wasn’t packed, but I figured more aficionados would show up later. The divine Ms. Eden hadn’t yet shown up, so I left Anne with the other giddy Jeannie fans, traveled a few aisles down, and joined another line in progress for Scott Wilson. You might know him best as the late, kindly Herschel from The Walking Dead. I also know him from the classic film adaptation of Truman Capote’s In Cold Blood. Anne thinks we look like father and son, and found our similar expressions priceless. Unintentional, honestly. In the film as a younger man, Wilson played the complete opposite of Herschel, a cold-blooded killer who charms the ladies and swindles the salesmen while he and Robert Blake enjoy life on the lam after brutally murdering an innocent Kansas family. Wilson’s chilling performance was more disturbing to me than most of the “walker” kills on his last TV gig. 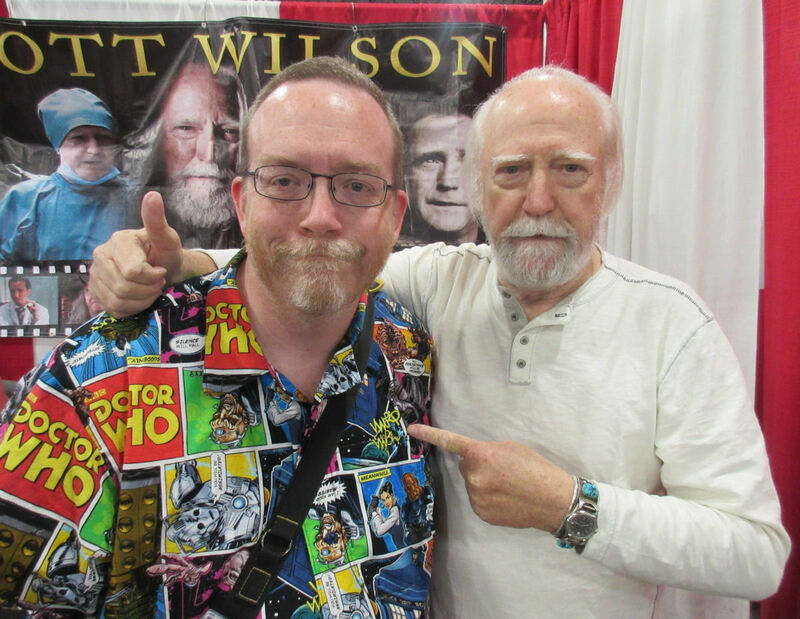 I was a little shocked that there were only four other people in line ahead of me when I joined them, but a quick check of the internets told me he’s been to this con before. Between that and possibly the mere passage of time since he left the show, I supposed that made a sort of sense. Less waiting for me, I guess. By the time I returned to Anne’s side, Eden was there and working her way through the eight or ten VIPs first. Also returning shortly after me: the talented Mr. Barrowman for his meet-‘n’-greet and photo op. Because everyone you’re a fan of is also someone else’s fan. 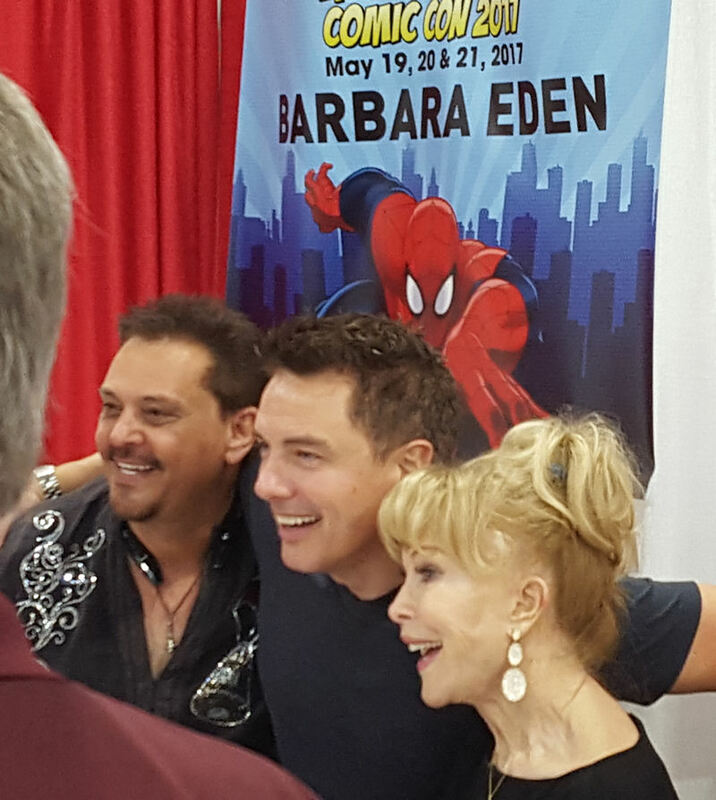 At far left with Merlyn and Jeannie is Mario Della Casa, the artist who designed the Official Jeannie Bottles. Lovely handiwork. Eventually Anne got her turn and her moment of giddiness. And with that, we’d wrapped up the highest-priority names on our autograph wish list. It wasn’t even noon. For the sake of prudence, we got lunch out of the way and resigned ourselves to sampling the convention center food. Final verdict: much better than Wizard World Chicago’s, maybe tied with the Indiana Convention Center’s, nowhere near C2E2 levels, and a far cry from the greatest convention center culinary delights we’ve ever had at Cincinnati Comic Expo. But it didn’t kill us, which of course meant we were stronger now. We’d need our strength as we prepared to dive into their Artists Alley, which was on the opposite end of the show floor from the actors’ booths. But I made a point of meeting two creators whose works had left large impressions on me as a teen and young adult. First up: the idiosyncratic Ted McKeever, who made me a fan with his earliest black-‘n’-white works Transit and Eddy Current, the latter of which took me years to track down all twelve issues of its story. He later brought creator-owned works to Marvel’s Epic line and DC’s Vertigo imprint, none of them like any comics next to them on the stand and hard to describe within the space of this single paragraph. I bought a sketch of DC’s Robotman, which you can see in the final photo in this entry. You’ll note it’s exceedingly rare for me to buy sketches at cons. We arrived just as he was telling the story of the one time a major DC writer demanded McKeever be fired from his project while McKeever was sitting right there. He also told the tale of a peculiar night he hung out with other comics creators that I will never, ever repeat for the rest of my life. Right next door to McKeever: Kyle Baker! 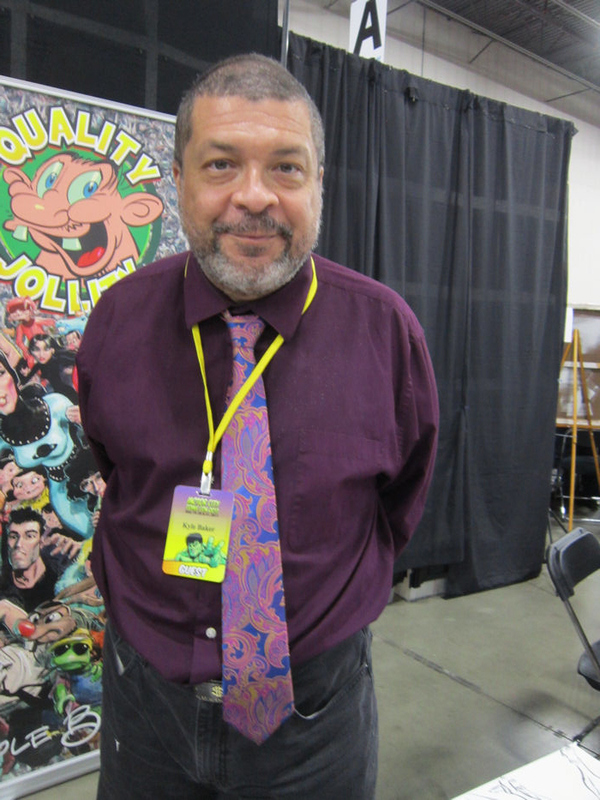 He entered the field as an inker in the ’80s, but quickly graduated to doing his own thing, starting with the original graphic novel The Cowboy Wally Show, a kiddie-host satire (beating Krusty to the punch by a few years) that was one of the most hilarious things I ever read in high school. I read it and read it again until it was dog-eared, and then I was sad because it was a library book. I bought his next graphic novel Why I Hate Saturn the week of release and laughed just about as much. Truly funny funnybooks are sadly not as common as you’d expect in the world of comics. For my money, Baker made at least two of the best of them. He still dabbles in occasional work for Marvel. Among other less amusing fare, he illustrated the controversial The Truth: Red, White and Black, about the government’s secret precursors to Captain America’s super-soldier program, so there’s that. Shortly before 1:30 we slowly, ever so slowly, made our way out of the increasingly dense exhibit hall to head toward the speaker room at the farthest end of the entire building, well past the autograph area. We got sidetracked for a minute by an extra-length line on the way that turned out to be for John Barrowman’s 2 p.m. panel. Shortly beyond them, we passed a long curtained hallway at just the right time to watch a running volunteer plow at top speed right into Barrowman himself speeding from the other direction. Thankfully no one seemed damaged. Our next event: a 1:30 Q&A with the legendary Dave Gibbons, co-creator of Watchmen. It’s now thirty years old and remains one of the most groundbreaking stories in the history of comics. It’s disappointing on one level that very few works have even tried approaching that level ever since, but still. He looks rather different from the photo I recall seeing in Amazing Heroes circa 1985. * Gibbons was first inspired to take up pen and pencil for a living when as a brash young man he decide he could draw better than Barry Windsor-Smith. Eventually he worked up the talent to enter the British comics industry on titles like 2000 AD and Marvel’s UK line, including Doctor Who. * He loved working with Mark Millar on The Secret Service, which was recently adapted into the movie Kingsman: The Secret Service. Since the movie diverged so wildly from the comic, they’ve decided against any comic sequel so the movie series can continue forging its own path. * The moderator brought up the only subject that had occurred to me: asking about his graphic novel The Originals, one of the very few projects Gibbons wrote and illustrated himself. 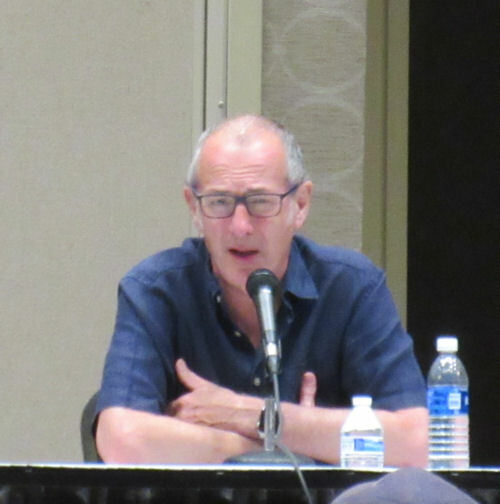 When the time came to do his own thing, Gibbons was inspired by the idea of someone his own age getting angry at young whippersnappers co-opting the styles of his youth, and decided to expand on that in a modified alt-future setting so he wouldn’t have to spend months on painstaking historical research. * He deems Watchmen co-creator Alan Moore “one of the most rational men I’ve ever met”, though admits they haven’t talked in years. * During the filming of Zack Snyder’s Watchmen, he was on set the day they shot the scene with the “Crimebusters” meeting flashback. He gave that scene two enthusiastic thumbs-up. Among the less benign topics: one brave soul poked at the elephant in the room and asked what Gibbons thought about DC’s efforts to drag the Watchmen cast kicking and screaming into the DC Universe with Rebirth, “The Button”, and the forthcoming Doomsday Clock. Gibbons’s diplomatic response: “I could choose to say nothing or I could choose to say everything. I choose to say nothing.” He added only that all parties have been in talks, and each is aware of the others’ feelings on the subject. Gibbons left it at that. After the retirement of DC President Paul Levitz in 2009, DC waited about twelve minutes before moving forward with the initiative that would ultimately spawn “Before Watchmen”, a 2012 batch of spinoff books written and drawn by anyone but Moore and Gibbons. Gibbons remained diplomatic at the time; Moore, not remotely so much. 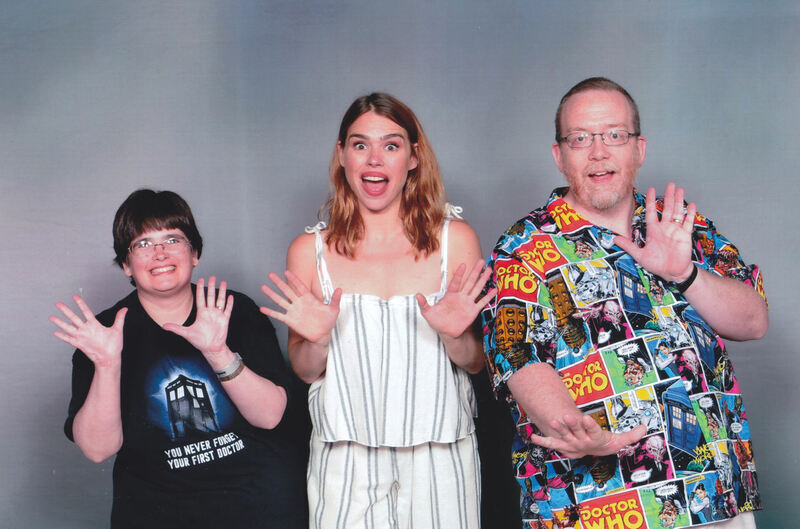 Then we made the long walk back to the exhibit hall for our next photo op at 3 p.m.: Billie Piper! You might remember her from such series as Doctor Who and Penny Dreadful. That’s right, readers. It’s time once again for jazz hands. Judging by the crowd size, our immobility for long periods, the complaints around us, and the fact that the last several dozen fans in Piper’s line had to be shunted to a designated overflow area until the main photo op area could be cleared, we reckon someone on the MCCC staff had decided there would be no such thing as a sold-out photo op at this show. The volunteers seemed to know what they were doing, though the creative rearranging of lines resulted in intersections, 4-way stops, and mass confusion among those waiting for other photo-ops and those who made the mistake of walking in the vicinity of this happy madhouse. That spring 2018 expansion can’t come soon enough for this convention center. Likewise, the photo pickup line was long and moved slowly, snaking behind the booths and through a curtained area filled with merchandise, boxes, random equipment, and an empty space where stars could sneak a moment of quiet time. Through a separation in the curtains, we and two young ladies peeked discreetly and saw TV’s John Barrowman grabbing a snack before launching once more into the fray. 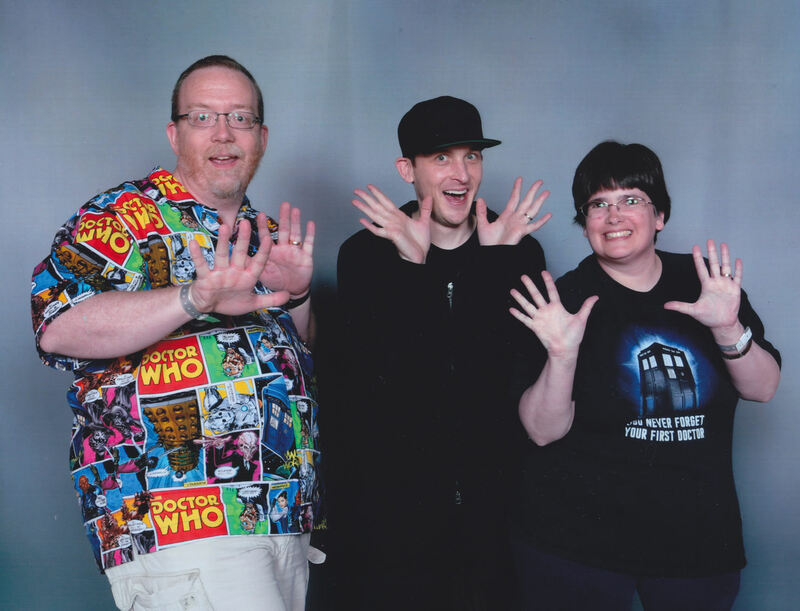 Eventually we got our photo and…turned around and got right back in line for our 4 p.m. photo op: Robin Lord Taylor! You might remember him from The Penguin Show, a one-season wonder on Fox about a fascinating young crime lord in the making, the unseemly underworld that rejected his greatness, the crooked cops who stayed out of his way, and the one super-crooked cop named Jim who kept ruining things and stealing his screen time. Anne and I thought well of that show, which no longer exists and is dearly missed. The End. We had a little free time before our next appointment. We recounted our funds and realized that by eating cheaply, and by spending next to nothing on back issues and clearance books, we had enough resources to toss in a bonus autograph and photo op. 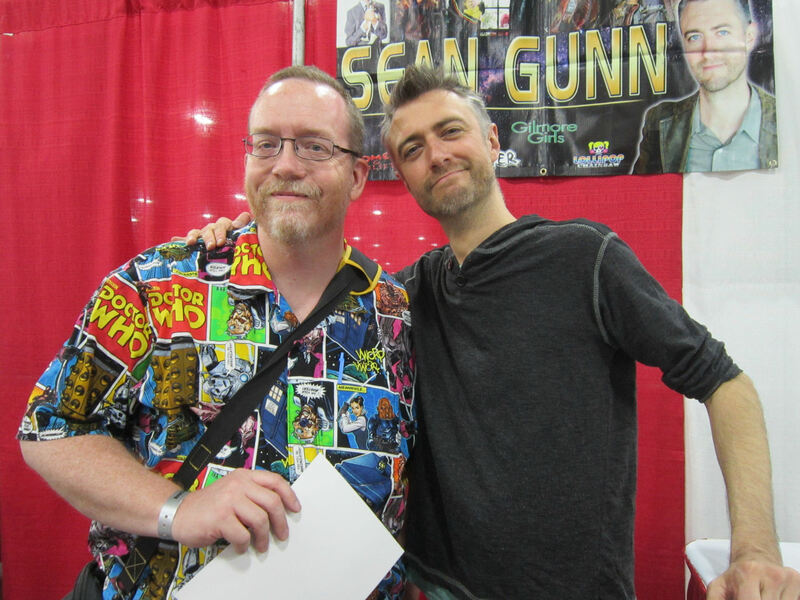 Conveniently next to the photo-op-drome was our next great actor: Sean Gunn! You might remember him as Yondu’s wingman from the Guardians of the Galaxy duology, or as one of the many nifty reasons to watch Gilmore Girls. Any long, longtime readers with elephantine memories may be slightly less befuddled at how one of my favorite things he’s ever done was a small but hilarious part as a perfectionist barista in two episodes of Amy Sherman-Palladino’s late, lamented ABC Family series Bunheads, which I used to recap here on MCC because that’s how much it wowed me even though I know next to nothing about ballet. If anyone else in the world has said the name “Bunheads” to him in the past year, I’d be very surprised. I hope I didn’t frighten him. That left us time to finish our mandatory trek around the entirety of the exhibit hall, which didn’t yield much else to our pocketbooks. We wandered through other parts of the autograph area and noticed quite a few actors with one or two fans in line, still others with no line at all. We saw the one child star we met last November; the frequent con guest whose name is legendary among other Wizard World Chicago fans and not in the best way; we saw one who used to recur at our 1990s Trek conventions; we saw non-actors, a couple of reality-TV folks, and a duo who once costarred in a famous movie whose line lengths were as different as Daryl Hall and John Oates. 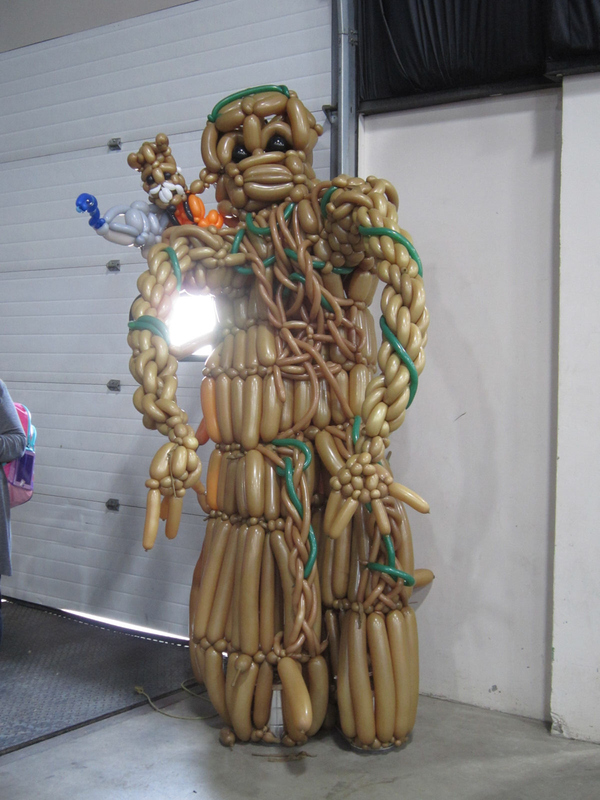 We also saw this cool balloon Groot and balloon Rocket. I’ll understand if you’d rather focus on that. At the very end of our Saturday, we had two last photo ops on our docket. As we waited for our lines to form, one volunteer ran over to us from the photo printers, apologized profusely and sincerely, handed us a copy of our Robin Lord Taylor photo, and returned to duty. She seemed so sad about this seeming letdown in customer service, and so proud to have made up for it, that we didn’t have the heart to tell her we already had a copy. Somehow a duplicate must have been printed by mistake and been left sitting there till our return. Anne usually holds on to our con photos for safekeeping, but thanks to this glitch I now have a new decoration in my work cubicle. 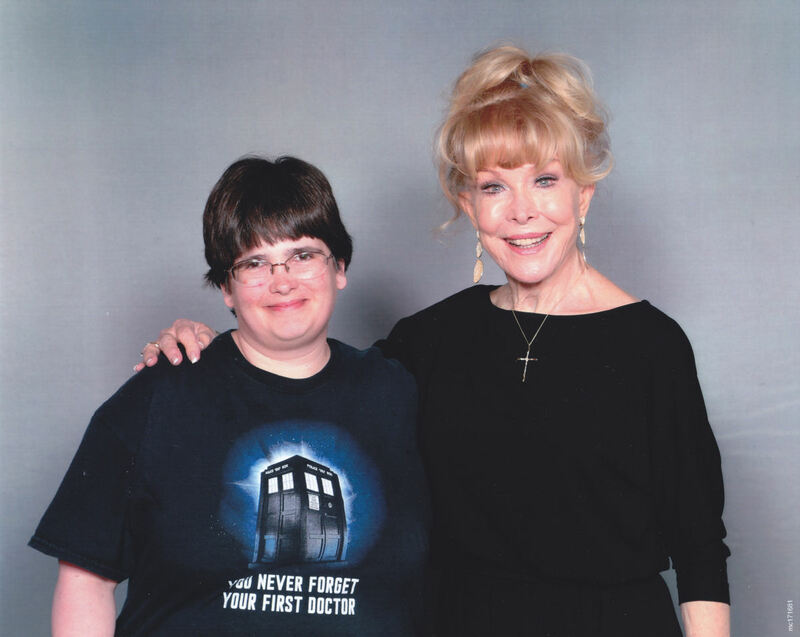 Next up came Anne’s Barbara Eden photo op, our lead picture way up top, which nicely bookended Anne’s MCCC experience. 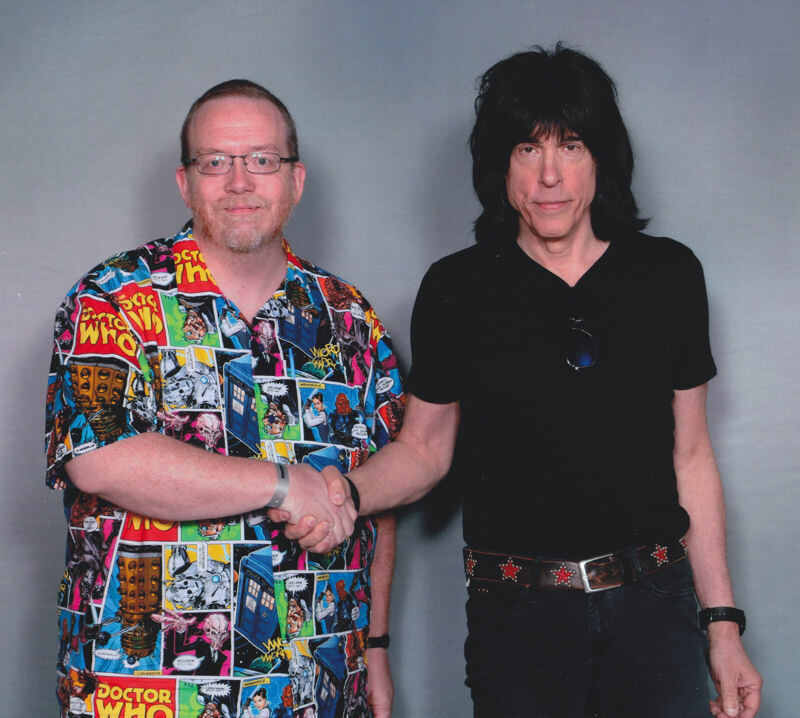 Then I bookended mine with one last hangout with rock legend Marky Ramone. That’s us, remembering rock-‘n’-roll radio. I was disappointed there were only nine of us in line for him, including the Jeannie cosplayer from Part 1. Compared to the hundreds-plus who’d waited for Billie Piper, or the hundreds after us waiting on Wil Wheaton’s turn, it seemed unfair to me. But Ramone at least got a brief pick-me-up. As he assumed his position before the camera, Barbara Eden was still sitting in a chair in one corner gathering herself. They saw each other and smiled, and she waved back at him with adorable gusto. As I tried to exit the booth, the volunteer in charge of handling bags became the second person that day to ask me if they could take a photo of my shirt. It’s definitely not a question I’m used to getting. It’s a very good shirt. I’ll never be a true fashion blogger, but if you’d care to indulge this rare moment of MCC’s Outfit of the Day, curious parties should check out That’s Terri-Ific, the seamstress’ official Facebook page, where she offers photos and samples of the variety of her custom geek-wear. She also had a booth at MCC and was a sincere pleasure to meet in person. And that was a wrap on our first Motor City Comic Con experience. Before our Saturday night hotel coma and our long drive home Sunday, we capped off our four-star day with dinner at a gyro place across the street called Ahmo’s, which whips up a fine, filling kefta plate if you don’t mind the wait. MCCC is a long drive for us, but it’s entirely possible we’ll be there again someday, if only to play another fun game of “Where’s John Barrowman?” I did make sure he wasn’t in our back seat before we took off, though neither of us would’ve kicked him out. The old books they signed and the new stuff I bought. 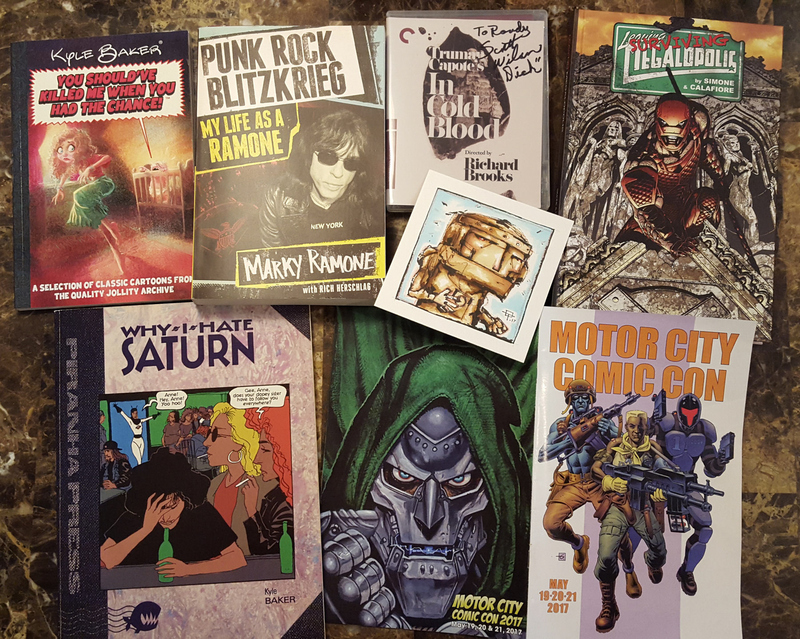 At lower right, MCCC also put together a nice program — original front cover art by Dave Gibbons; back cover Doom painting by Simon Bisley. A quality program is generally a sign of a quality convention. « Motor City Comic Con 2017 Photos, Part 1 of 2: Cosplay!